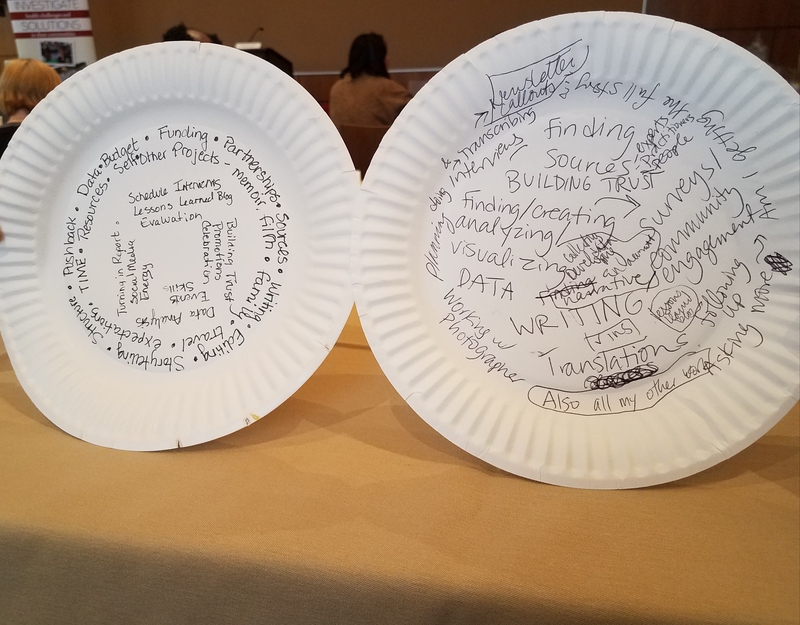 2019 California Fellows jot down all the tasks "on their plate" during a workshop this week. Ambitious reporting projects can overwhelm, produce anxiety and take months to complete. They start with an exciting idea that for many reporters can then turn into a dark labyrinth of despair. There are experts to find, interviews to do, data to be crunched, photos and videos to coordinate, and then, compiling all that complex information together to create an easily digestible story or segment for the audience to consume. But completing a big project starts with one simple rule: Get organized, urged Catherine Stifter, a former senior producer at Capital Public Radio. Stifter, who routinely managed up to 15 projects at a time, shared her tips with fellows at the 2019 California Fellowship this week. While organizing is the easiest part of completing a project, it's often the step most overlooked, she added. Your project’s organization “doesn't have to be perfect," Stifter said, but it's a critical first step. Fellows voiced their most common anxieties about their projects and many had the same concerns: finding sources, meeting their own high expectations, lack of confidence in their own ability to complete the task, finding time to focus on the work because of staffing shortages in newsrooms, and even lack of interest or support from editors. Some also mentioned the fear of suffering from "brain melt" or boredom halfway through the project. Stifter said journalists need to find a balance between what needs to get done and managing those concerns. It’s the art of plate spinning, she said, that circus act where a person spins plates on poles without them toppling. One exercise to alleviate stress is to write down everything that needs to be done, Stifter said. She recommends using a paper plate.Think big picture, she added. Don't get down into the weeds just yet. "It's an activity to think about in terms of what's on the plate," Stifter said. "Just brainstorm and then organize. You want to stay big until you have to get small." Items to write down include planning, funding, reporting the story, writing, editing, production, using social media, evaluating the work — and even celebrating once the work is completed. Throughout the project, journalists need to communicate with everyone involved on the project, from photographers to social media staff, Stifter said. Describe your project in one memorable sentence. Who's on the project team and what are their roles? Stifter also recommends creating and keeping a chart on Google Drive with names and dates of sources contacted, when they were interviewed and photographed, as well as other tasks related to the project. Stifter said the organizing process needs to be ongoing and updated, until little by little, the daunting big story project starts to come into focus. "Organizing a big project is no big deal," she said.